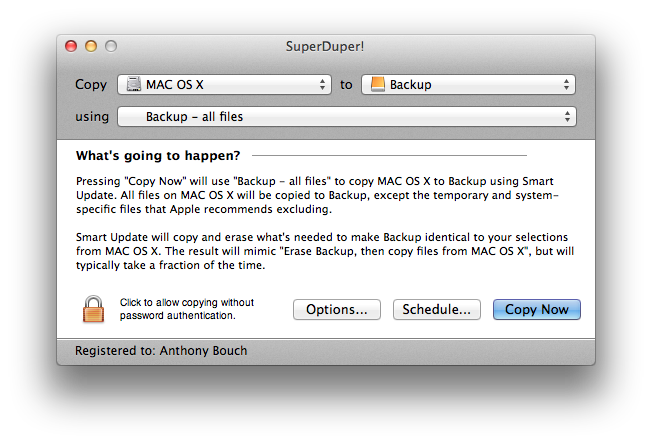 Here's a recipe for encrypting an external drive with Mac OS X FileVault, and then creating an emergency bootable backup using SuperDuper. Start Disk Utility, and partition the drive as shown below. I chose to create two equal size partions using the Partition Layout options. Make sure that the first partition is at least the same size or larger than your internal MacBook or iMac drive. You must format the drive as Mac OS Extended (Journaled), and from the Options button - you must choose GUID partition types. You can test the drives by ejecting them using Finder, and then plugging them back in again. You should receive a prompt asking you to enter the password you chose, which will unlock the drive. We're now ready to backup your internal hard disk using SuperDuper. I like SuperDuper because it creates a mirrored external drive that is also bootable. It doesn't serve the same purpose as Timecapsule backups, which give you a rolling history of files backed up from your computer. 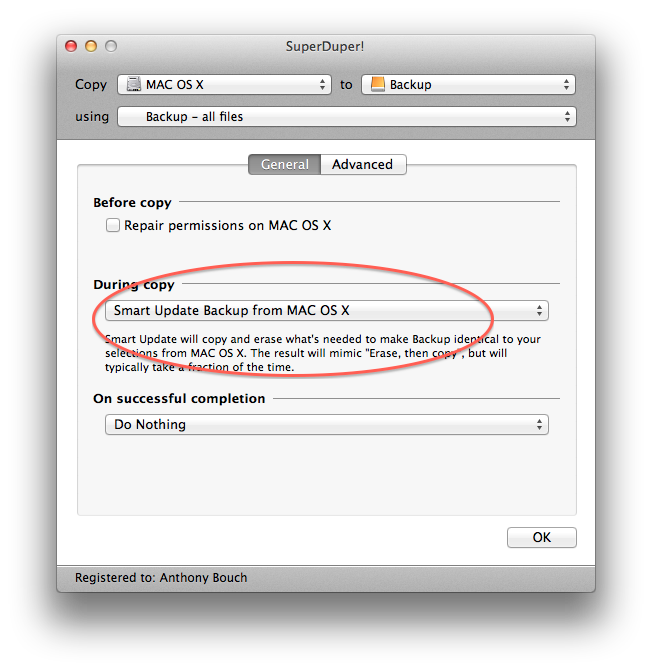 Instead, SuperDuper will simply keep your emergency backup disk 'in sync' with your main system disk. This disk can then be used elsewhere, to boot another computer with 'your' system. Or as an emergency drive if your main disk fails. Or as a method of restoring your complete system if you decide to upgrade your internal hard drive. Download SuperDuper from Shirt-Pocket software. Drag the application to your Applications folder, and start SuperDuper. Choose your source and copy to drives as shown below (NOTE: Most system disks will be called Macintosh HD. I've renamed mine to MAC OS X). SuperDuper is not free, but I think it's worth the price given the value of having a ready-to-go emergency standby disk. The paid and registered version will also give you the option to perform Smart Updates which will only sync up the files that have changed since your last backup - a lot faster than performing a full back every time you run SuperDuper. Note also, that since we're syncing up the two drives, any files removed from your main OS disk, will also be removed from the external disk. There are also advanced options which will let you do things such as run a shell script before and after a backup. 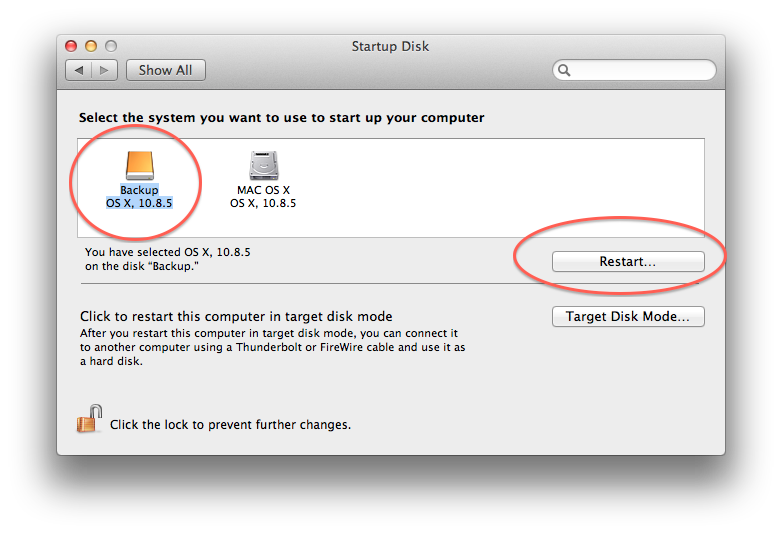 I use this feature to stop and restart a development database I have running on my MBP. If you're using a USB 3 or Thunderbolt drive, your first backup will take between 20 and 40 minutes depending on your internal disk size. Once your first backup is complete, I recommend booting from the external drive at least once to test that the drive has been prepared correctly. For the first re-boot we're going to force the external drive to become your bootable drive using the Startup Disk utility under System Preferences. Click on Restart. You'll be asked for the disk password during the restart and the system will then proceed to boot from the external drive. Even with a USB 3 or Thunderbolt drive, you may find that booting for the first time from the external disk takes a little longer than a regular system boot. Once the system has started up - we're going to restart using a different method to switch back to the internal disk. This time - shut down your Mac completely. Before pressing the power button, hold down the Option key - then press the power button to start. Holding down the Option key at startup will let you choose the boot drive. Choose your normal system drive this time - and you're done! These instructions aren't working for me with OS X 10.8.5 SuperDuper! 2.7.1. When I choose to restart with my encrypted backup drive using the Startup Disk System Preferences pane, my system reboots with my normal (internal) startup disk, seemingly ignoring the request to boot from my backup drive. Hello! I know it's Mac OS, but that seems ridiculously simple - encrypt the target volume, (assuming it's been formatted correctly), and let SuperDuper rip. What I don't get is, how is SuperDuper able to read and write to the encrypted volume without authenticating? After all, to do a Smart Backup, SuperDuper must be able to read the files on the target disk in order to determine which need updating, no? Nor am I clear on how it works when writing to the encrypted volume. Does File Vault encrypt anything written to the disk, on the fly, without authenticating? If SuperDuper can read and write to the disk, can't anyone? The encrypted volume is mounted when it's inserted into the USB/Thunderbolt port - after that SuperDuper , or Carbon Copy Cloner (which I'm now using) will treat it as an ordinary drive. Tried with El Capitan and SD version 98, works like a charm. Hello, "I chose to create two equal size portions...", -- why not one, a whole physical drive, partition?